The structure of the renal corpuscules of both types of nephrons is similar and comparable with those of mammals but the glomeruli are simpler and much smaller than those in mammals. In the micrograph above, red blood cells in the capillaries of the glomeruli are clearly visible and mesangiocytes can be demonstrated. In birds, these cells tend to form a compact mass in the center of the glomerulus, in contrast with mammals where they lie more scattered around. Podocytes and endothelial cells are hard to distinguish. The parietal layer of Bowmanâ€™s capsule is very clear. 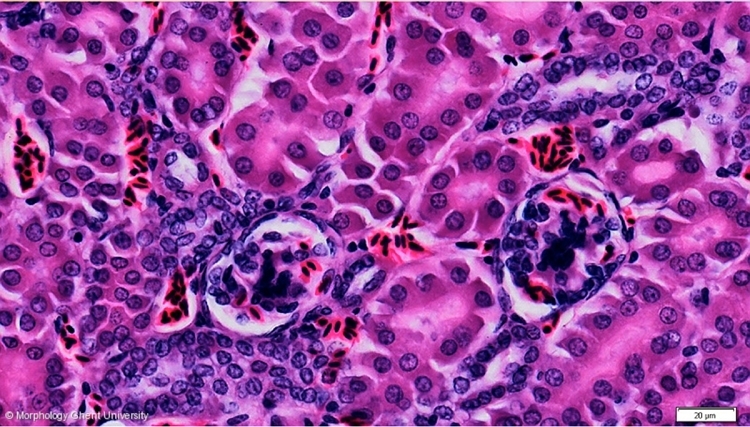 Both renal corpuscules on the picture are cortical types.